An Orkney-based renewable energy company is looking to the other side of the Pentland Firth to build a three-generator wind farm. Scotrenewables Ltd is planning to erect the turbines near Westfield in Caithness. The Stromness company says it has a different outlook to big multi-national wind power businesses. Managing director Barry Johnston said yesterday that the aim would be to plough some of the profits back into the local community in Caithness. Some £165,000 would be generated for the Westfield Community Council over a 15 to 20 year period, Mr Johnston said. The company also has well advanced plans erect a single two megawatt wind generator near the oil terminal at Flotta and hopes to have the machine up and running later this year. Mr Johnston said: "It cannot be stressed enough that the prime object in this concern is to establish a local company whose avowed intention is to keep the revenue within northern Scotland. "Too many other renewable energy companies are using the natural resources found in the Highlands and Islands, but diverting the revenue to other parts of the UK or of the world. "We strongly believe that the best way forward for renewable energy in the Highlands and Islands is not large-scale wind farms, owned by multi-national companies, that offer little benefit to the local community. "Instead, we aim to help improve the local economy by erecting small numbers of turbines and returning a percentage of revenue back into the community. "This is illustrated by the fact that the company's first Caithness wind farm will generate in excess of £165,000 for the local community council." The aim is to erect three turbines as well as an anemometer mast to collect wind data. Mr Johnston said the aim was to use local contractors as much as possible and to work closely with appropriate organisations to ensure that there is minimal impact on the surrounding area. Great care and a rigorous selection process were undertaken in the siting of the proposed development, he said. The location on Hill of Lieurary was chosen primarily for the high wind speeds found in the area and because it was fairly remote from densely populated areas. "The surrounding landscape features pylons, blocks of trees and quarries, both working and disused," he said. "Associated with these quarries are spoil heaps scattered across the landscape. "Access is ideal as there are already tracks present on the proposed site, meaning no new tracks will be required. "We believe that this small wind farm will prove acceptable and may perhaps even enhance the area." Scotrenewables Ltd is working with a graphic design company to help address concerns over the visual impact of wind farm developments. "A new technique is being developed to aid the visual assessment of wind turbines," added Mr Johnston. "It is hoped this method will help allay any fears local residents may have." The company is made up of three young Orcadian graduates. It plans to hold a public meeting in Caithness next month to discuss its plans with the local community. 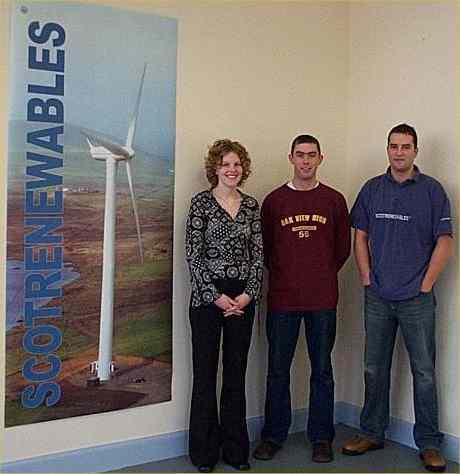 Scotrenewables Ltd hopes to inject money from successful wind farm projects into the development of other methods of harnessing renewable power, particularly wave and tidal energy. Funding has recently been received for the development of the company's own tidal turbine, with a full-scale tidal demonstration system planned for 2005.